The Sims, by design, is meant to be as malleable as the Sims you create. Sims fans create challenges to spice up this open-ended world, like the Legacy Challenge or the Random Genetics Challenge. I’m trying to beat the 100 Baby Challenge. It’s the hardest task I’ve ever set for myself in The Sims. In this challenge, you try to have 100 children in as few generations as possible. All the children must come from a different father, and once the Sim you’ve designated as the matriarch passes childbearing age, you must select an heiress to continue the challenge. Since households in The Sims 4 can only hold eight Sims, you can move children out once they become Young Adults, but they can’t be moved back in after. There are many more detailed rules in this fan-made Google document, mostly concerning the cheats that aren’t allowed. You can’t artificially lengthen your matriarch’s lifespan or cheat to get around household size. I don’t usually finish Sims challenges. I keep starting them, and then giving up on them. The furthest I ever got in a challenge was the Not So Berry challenge, which involved very specific, and color-themed, rules for a ten generation family; I lost interest after generation two. The 100 Baby Challenge caught my interest because it’s so unusual. I don’t want to give up on this challenge, too, but it is by far the hardest thing I have ever done in this game, and it made me want to die. Here’s the thing about babies in The Sims. They’re annoying. In the baby stage, they’re basically just inert objects that cry a lot. As toddlers, they make messes and have to be taught skills. As children and teenagers, you have to make sure they go to school and do homework. All these child-rearing activities take time and make your Sims stressed. The 100 Baby Challenge also stipulates that your matriarch cannot get married or merge households with any other family, meaning you’re doing it all solo. Raising one kid is enough to set me on edge in The Sims. Raising eight at once, with the intention of raising more, seemed impossible. I started the 100 Baby Challenge late last year. Today, I decided to try again. I cracked open my long-abandoned save file and was greeted by a cacophony of crying children. The bathroom was filthy, the toilet was broken, and my Sim’s eldest was unhappily mopping the floor. You’re also not allowed to have a job outside the home in this challenge, so my matriarch was painting a picture to sell. 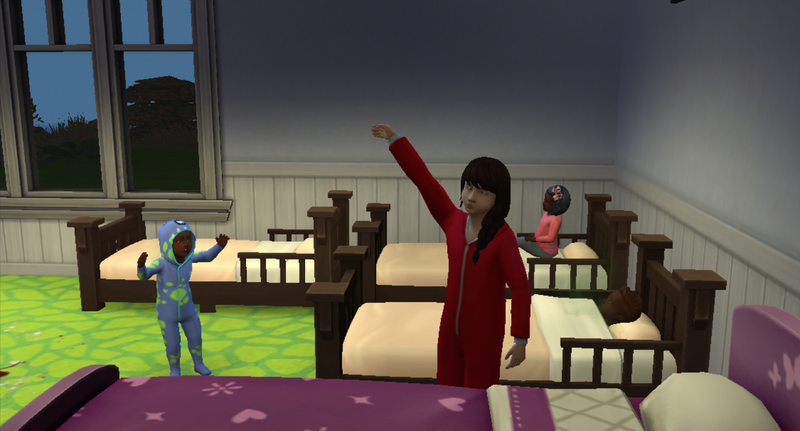 Meanwhile, my three toddlers resided in a jail-like, bare bones bedroom. We had 500 simeoleons total to our name, making our financial situation pretty dire. In this save, I was only up to four babies, but my past self had accomplished this pretty fast thanks to some good luck: on my Sim’s second pregnancy, she had triplets. Now that I was logged back into my save, though, I saw a problem. My matriarch wasn’t currently pregnant. As stated in the rules document, the 100 Baby Challenge is much easier if your Sim is pregnant pretty much at all times. I made a plan to put the kids (and their mother) to bed. Once Mom woke back up, we’d find her a mate first thing. The first hiccup happened that night: two of the toddlers had a nightmare, which woke up the oldest child. The next day was a Sunday, and the oldest kid hadn’t done her homework yet. It wasn’t due until Monday, but it seemed unlikely she would ever get to it, since she’d spontaneously taken up cleaning duties in the house. As she mopped a puddle in the upstairs bathroom, the clock struck 2 in the morning. My struggling single mom tried to get the toddlers to quietly play with blocks until they calmed down. It didn’t work. Everyone in the entire household was wide awake after only a few hours sleep. I was already in hell. And then one of my Sim’s sons took off all his clothes and started running around. The next day, I invited over a single man to try to get my Sim pregnant again, and then all three toddlers started making messes. My Sim disciplined one, but by the time she finished, there’d be another toddler acting out. One kid made a mess outside, another banged pots and pans together in the kitchen, and then another splashed in the toilet. The eldest, by this point, collapsed in bed. My Sim’s would-be suitor had already left by this point. I was remembering why I gave up on this challenge so many months ago. By 8:30 pm, my matriarch was exhausted and no closer to having another child. I sometimes daydream about becoming a bitchy Westchester mom. The kind of woman who shows up to PTA meetings in Louboutins, with a folder of all the times the teachers have wronged their child. But playing through the 100 Baby Challenge keeps all my motherhood fantasies in check. I can barely keep a houseplant alive, let alone four virtual children. Still, this challenge is pretty fun, if you’re the kind of person that enjoys watching things fall apart. And, on some level, I do. My matriarch is slowly deteriorating. She tried to take a bubble bath to calm down and one of her kids immediately walked in on her. I mean, look at her. She’s eating macaroni and cheese alone at two in the morning and she’s miserable. I hope to revisit the 100 Baby Challenge soon, especially now that I know how much multitasking it’s going to take. I need a break right now, though. Unlike my matriarch, I do have room in my schedule for a little me time.